'Making a difference' can have a huge impact on the lives of those who are living in little privilege and ease. We wanted to share with you an encouraging story about the effect Bestow Beauty's charitable organisation partnership, the Bestow Sisterhood, is having on the lives of young girls in Cambodia. The 'little sisters' we sponsor do not have the same opportunities that we have here in Australia. However, we received some wonderful news this week which shows how well the Cambodia Charitable Trust (CCT) is doing in bridging this gap. Back in 2015, Janine Tait (founder of Bestow Beauty) and her husband Kevin joined her sister, Denise, on one of her trips to Cambodia. During our trip, she visited an academy in Phnom Penh set up by an American charity to provide support and accommodation for young, rural Cambodian women to make it possible for them to attend university. Under normal circumstances, it is virtually impossible for rural Cambodian girls to attend university in the city without outside support. It would be far too dangerous for her to live alone so far away from her family. Young men, on the other hand, are safer and more equipped to look after themselves. It was on this trip that she realised how crucial these charities are at providing the vital link in improving young women’s access to university education in Cambodia. Janine was delighted to see that the young girls at this academy were supported above and beyond their university studies. They had extra classes to improve their English and learn skills in diplomacy and ethics. This kind of support meant they had far greater options upon graduation even the possibility of travelling overseas. She wanted to know if some of our rising stars from the Cambodian Charitable Trust could attend this academy and follow this pathway towards university. Discussing a variety of options, like donating some of our personal funds to the academy in exchange for taking in our girls, Janine was hopeful and excited about this possibility. Unfortunately, Souen, the CCT Cambodian Manager, broke the news that it was unlikely that any of the CCT sponsored girls would achieve the academic levels required to be accepted into such a place. Growing up in the poverty-stricken conditions of rural Cambodia they were simply too disadvantaged, not to mention malnourished, and though CCT hugely improved education standards at their schools, they couldn’t compete with the quality teachers and education opportunities in the bigger cities. The best they could hope for, was for our sponsored girls to become mothers who then tutored and encouraged the next generation of girls to pursue this type of opportunity. Saddened by this news, Denise and the CCT still continued their amazing work – upskilling teachers, upgrading school facilities and sponsoring children, thanks to sponsors like the Bestow Sisterhood. CCT-sponsored schools, teachers and students have been going from strength to strength. 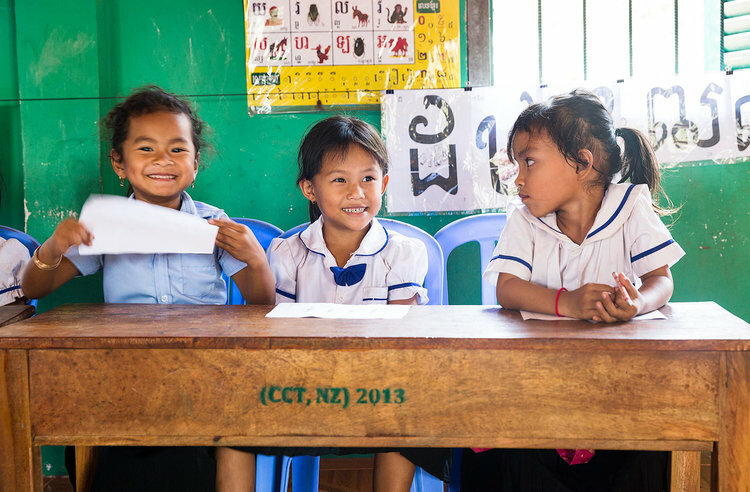 Their work has been recognised by the Cambodian Ministry of Education who have asked them to implement a teacher training programme across all of Cambodia. It is expected that the programme will raise the standard of education throughout the country! “When we visited Ang Seyma Secondary School last month we were concerned that the dropout rate at the school has increased. The school director puts this down to the poverty in the area: the poorest families borrow money, can’t manage the repayments and end up withdrawing their children from school and sending them to work in the garment factories or on construction sites to help repay the loans. In other cases, the parents move to Phnom Penh or Thailand for work and leave their children with grandparents or relatives. The parents are rarely able to come home to visit, so the support to stay in school and get a good education is diluted. While this depressing pattern was occurring regularly, the school director told us about five amazing, high-achieving young women, four of whom are sponsored through the Bestow Sisterhood. He said, without a doubt, all five would have dropped out if it wasn’t for their CCT sponsorship. Ol Chontea, sponsored by Hady Wenham at Forme Spa and In Sreypheap have both been selected to sit the exam to find the top performing Grade Nine students in the country. Ouch Sokanha, sponsored by Matt and Lisa Williams of Professional Beauty Solutions – who distribute Bestow in Australia, and Lek Sam Ath, sponsored by Bestow Beauty, have been selected to sit the same exam for grade eight. Leng Rachny, sponsored by Sarah Huggins from Inspire Beauty & Day Spa, is always top of her class in grade seven. This sort of news is so encouraging. It was not that long ago we were told none of the students in our remote, rural schools could compete for top places against students from the cities. A few years later, the quality of the education they are being provided, and the support of their amazing sponsors, has led to these young women achieving at a highly competitive level academically. A heart felt thank you to those sponsors, you really are changing lives. Against the odds, there’s a good chance that these bright, dedicated girls will have the opportunity to attend an academy like the one we visited if they wish to. Each are likely to go on to have bright futures with choice and autonomy over their own lives – something that was looking very unlikely just a few years ago. "We are blown away by these results which go well beyond what Denise and I thought would be possible. We feel so encouraged that by coming together as the Bestow Sisterhood and partnering with the CCT, we are opening up new possibilities for girls growing up in Cambodia who start out with far fewer opportunities than we have." - Janine Tait says. PS: If you would like to sponsor a girl through the Bestow Sisterhood, please CLICK HERE.